The towermatic from No Bolt is neither a scaffold nor a scissor lift - it is a totally new concept that enhances safety and productivity when working at height. 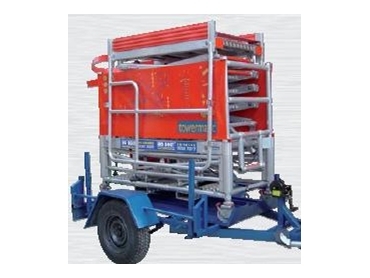 Supplied in one compact unit weighing no more than 320kgs, the towermatic has six platform heights ranging from 1.65m to 4.00m that can be altered in seconds. Easy to use, transport and store, the towermatic does not require a power source, engine or batteries. Operation is simple. Once the unit has been positioned safely and the platform cage assembled, depressing the mechanism release bar unlocks the height adjusters and activates the patented, failsafe tension system. This allows the operator to manually raise or lower the work platform to a maximum height of four metres in seconds, smoothly and silently. Stepping off the foot control bar double locks the tower at the desired height. Access to the work platform is gained by the integrated ladder.